Home » architecture » Blog » Celebrities » Charities » Comments » cookery » Cruises » Cuisine » Featured Articles » History » museums » tours » Travel » UK » DINNER ON THE ROYAL YACHT BRITANNIA A never-to-be-forgotten experience. This is my favourite article of 2016. It was an experience that will live with me for ever! A lone piper played as we walked along the long red carpet, the back of his heavy kilt swaying from side to side. It was a bitterly cold evening and we were glad to step into the yacht’s welcome warmth, taking a glass of champagne from the waiter’s tray as we passed. To the right is the reception area, and the lounge. I sat where the Queen used to sit, on one of the floral settees. The lounge is surprisingly homely and welcoming, with a fireplace, a grand piano, and matching settees and chairs, with small side tables beside them. We were given a brief tour of the yacht, followed everywhere by two waiters, one with canapés and the other with Champagne. All the clocks were stopped at one minute past three in respect to the Queen’s last visit. 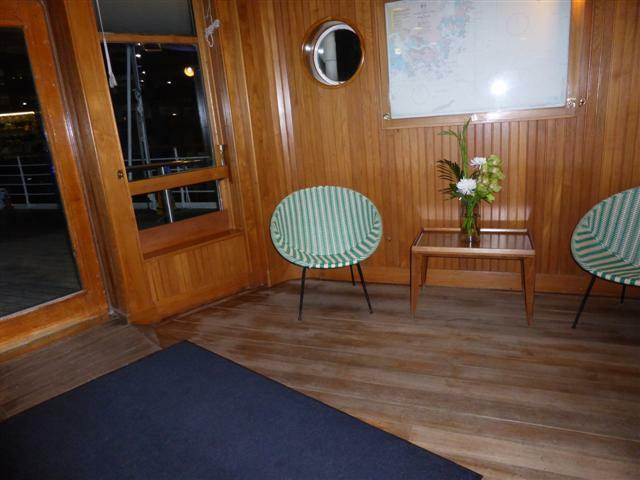 First we visited the Captain’s suite of rooms, which had a sofa and chair which were over 100 years old, and a large dining-room. All the Officers would eat together daily, and the Queen often ate with the Captain. Sometimes the Captain had to wear up to 12 uniforms a day! The sun deck was where the Queen and other members of the Royal Family had breakfast every morning at 8.30. The furniture is 1960s plastic. There was a bar, and a large barrel which used to contain rum for ‘splicing the mainbrace.’ Every day until the 1970s each member of the crew was entitled to ½ pint of rum daily! On the deck, a swimming-pool was sometimes erected for the Royal Family’s use. Deck quoits was also a very popular pastime. The deck was scrubbed, starting at 4.30am, every day. If any of the crew saw the Queen, they had to ignore her. Along the wooden corridor was the Queen’s bedroom. It’s quite small and basic, with a bathroom. Again, she preferred floral prints. The Duke’s bedroom was through an adjoining door, and decorated in a more manly style. Across the corridor was the family Honeymoon suite/guest room/nursery. I elegantly swept down the stairs at the end of the corridor. Anyone in the reception area and the lounge could see me approaching. But nobody took any notice. They were all too busy talking about whisky! George lV stepped ashore at Leith, outside Edinburgh, in 1822 and asked for some Glenlivet Whisky. A Performing Poet enthusiastically praised Scottish whisky in a specially-written poem. A lot of us didn’t understand what he said, but we loved the way he did it! There are several small side-rooms, where guests could read, access their computers, or talk in private. 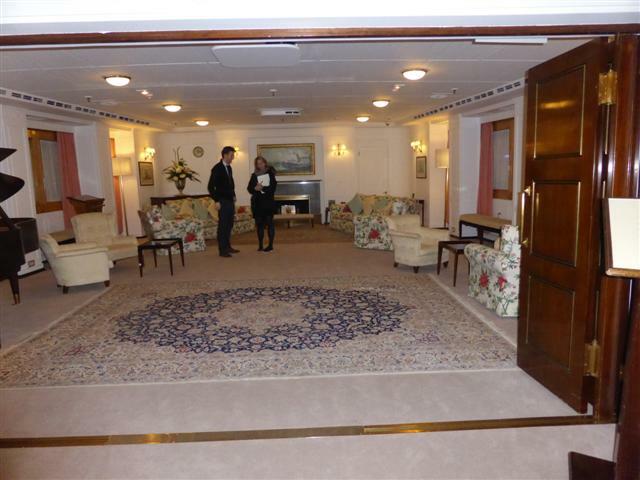 The huge State Dining-room is along the corridor from the lounge area. I’m not sure how many it can seat, but it must be around 50. ‘I bet the Queen didn’t have to do this!’ I said, sprawling over half the wide table to reach the silver salt and pepper. Cabinets line the dining-room, with gifts from all over the world. When the Queen was entertaining an Official, gifts from that country would be sorted out and displayed in the cabinets, among others. Wherever the Queen went on the yacht, her business entourage travelled separately. As a starter, we were served an Amuse-bouch; a soup in cups. I’ve never seen such perfect service anywhere in the world. All the waiting-staff lined up on one side of the table, wearing white gloves, and, at a word from the Head Waiter, they all put the cups or plates down in front of the diners at once. Then they repeated it on the other side of the table. 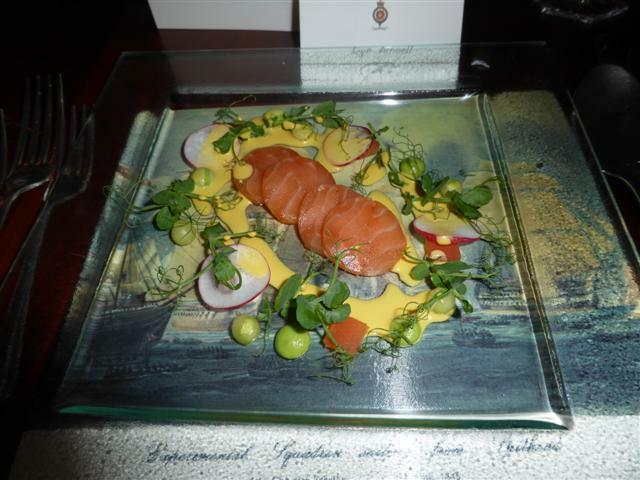 Next came Cured organic Shetland salmon with a saffron and shellfish dressing. It was simple and pretty, served on a glass plate. This was followed by Roast fillet of Orkney beef with fondant potato, parsnip puree and a port wine sauce. The pud was Mango tart with raspberry sorbet and a passion fruit coulis. I thought I was full, but it was a very refreshing dish. Finally, Coffee was served with trays of hand-made petits fours. Again, some spare room was miraculously discovered in the depths of my happy stomach! I was given a tour of the kitchen by Bruce, the Fine Dining Manager. We had two chefs, but sometimes there were up to four for a big function. 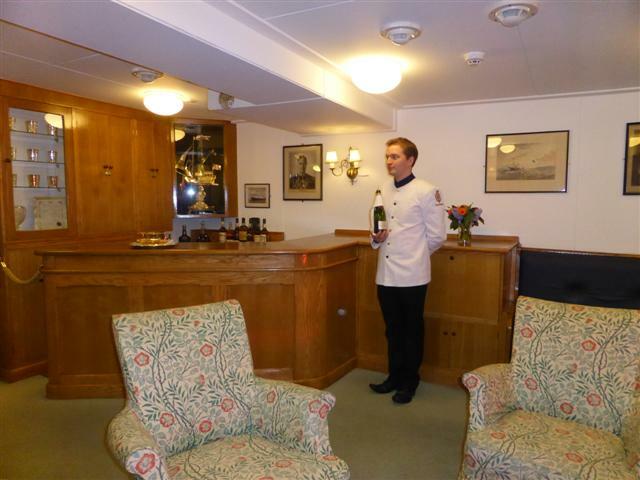 The ex-yachtsmen meet once a year for a dinner on the yacht, but the Queen’s never been back – to anyone’s knowledge. But a couple of landrovers with blacked-out windows were once spotted beside the yacht. They waited for a while, then they drove away. Zara, Princess Ann’s daughter, had her wedding reception there, but the Queen didn’t attend. Built in 1953, the yacht served the British Royal Family for 44 years, and was finally given to a charitable trust. It was the only non-profit making offer put forward. So now Britannia is permanently moored in Leith, just outside Edinburgh. The barge, used by the Queen in bad weather, is moored beside the yacht, and her Bentley is in a glass case on the deck. Picking up my glass of wine, I left the dining-room, and sat in the Queen’s favourite seat one final time. I found it quite sad as I sat there looking around me. No wonder the Queen was fighting back the tears as she said goodbye to her floating home. It really was a relaxing, simple break from her palaces and castles. Yes, I was sorry to leave it too! Lyn was a guest of The Glenlivet, celebrating the Glenlivet Founders’s Reserve launch. Not long after The vessel was moored at Leith, the British media relations arm of Audi, the German luxury car brand, hosted a press event on board. 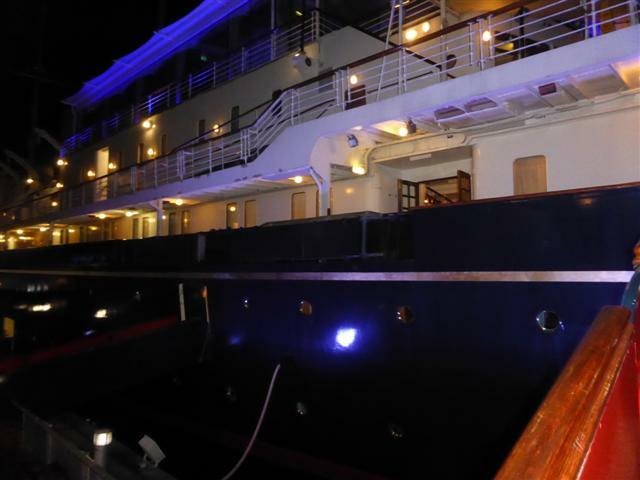 It was the very first time that Her Majesty’s former yacht had been used by a commercial firm. The on-board service was impeccable during the meal and the ‘tour’. It was a most privileged opportunity.